The British Touring Car Championship is one of the best-loved, most illustrious and famous motor racing championships in the world. Since its inception in 1958 – only Formula 1 and the NASCAR stock car series have longer histories – it has attracted and captivated millions of fans right around the world. Now with unprecedented levels of national television coverage from ITV, the 2-litre formula continues to provide one of motor sport’s most addictive, action-packed atmospheres for an audience of millions as well as the perfect platform for teams, drivers and sponsors to raise their profiles and reputations. The BTCC season consists of ten events (or rounds), each featuring three races of equal distance. That’s 30 races for the entire season, with points in all 30 counting towards each driver’s end-of-season score. The three races take place on Sundays (race days). Saturdays are used to stage the practice and qualifying sessions. On Saturday morning there are two 40-minute practice sessions that enable the teams and drivers to hone their cars to suit each circuit’s characteristics. In the afternoon, a 30-minute qualifying session is held. The times from this decide the starting grid order for the first of Sunday’s three race. If drivers have set equal times, the one who set it first will start ahead of the other. The starting grid for the second of Sunday’s three races is decided by the finishing order of the day’s first race. Sunday’s third race grid is decided by the finishing order of the second race but, uniquely, with the leading positions reversed. The number of positions to be reversed becomes known only after race two when a number between six and ten is drawn at random. 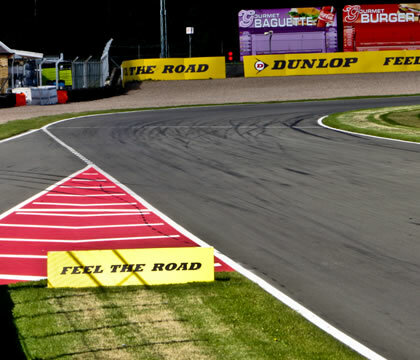 The 10-weekend schedule, which starts in April and ends in October, features three races at the leading race circuits in Britain including Donington Park, Brands Hatch, Silverstone and Oulton Park. For more details on all the circuits click here. The BTCC is firmly established not only as Britain’s most popular form of motor racing but also as one of the UK’s top sporting attractions with crowds similar in size to those at Premiership football and Test Match cricket matches. It is estimated that trackside figures in 2009 held steady with around 325,000 people attending the championship’s ten fixtures – this is highly significant considering the UK was sucked into a financial recession. That popularity is further reinforced by the fact that the average attendance at grounds on the opening day of the 2009/10 Premiership football season was 30,235 – figures that really do put the BTCC firmly in the ‘big league’ of British sporting events. The secret to the BTCC’s on-going success is simple: unrivalled entertainment at affordable prices. Most of all, the BTCC is a fast-moving show designed to compete against theme parks, shopping centres just as much as other sports for the public’s leisure time. As Britain’s biggest motor racing championship, the BTCC commands enormous media coverage throughout the UK as well as globally. Television has always been the BTCC’s most powerful medium, and since the late Eighties the championship has received regular coverage from Britain’s biggest TV operators. Having broadcast the BTCC since 2002, Britain’s premier commercial television network, ITV, has committed to a minimum of three more years’ coverage of the championship. Its live coverage of the series, on its ITV4 channel, is unprecedented in UK motor sport and provides the BTCC with a TV arrangement that puts even those of highprofile international series firmly in the shade. Indeed, not even Formula 1 receives as much live TV coverage in the UK as the BTCC race day.